Diya Mirza, Zayed Khan and Sahil Sangha. What do these three individuals have in common? A brand new spanking production house trading as Born Free Entertainment which is making its debut into the Indian Film Industry with Love Breakups Zindagi. 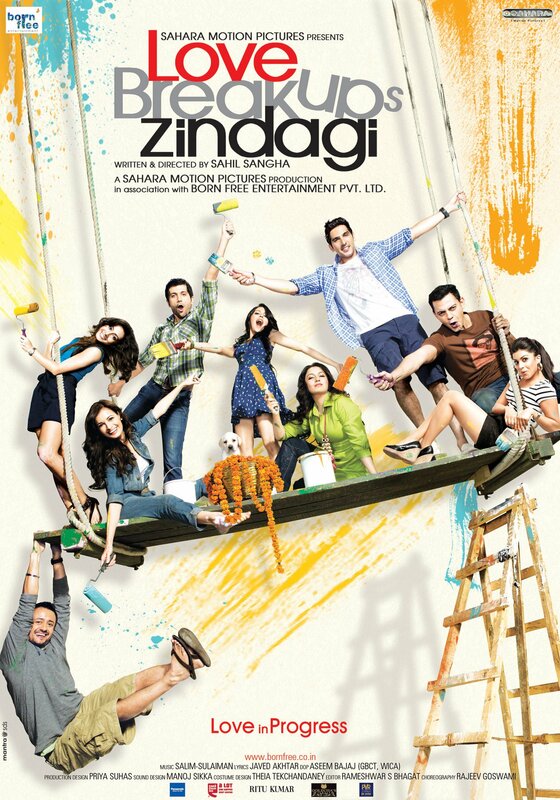 Indicative of being a romantic dramedy , Love Breakups Zindagi is directed by Sahil and stars his partners in crime, Zayed (Main Hoon Naa) and Diya (Parineeta). The premise of Love Breakups Zindagi is youthful, urban and fresh, qualities that have been greatly reflected in its soundtrack. The Brothers Merchant, namely, Salim-Sulaiman, fresh from their roaring success of Band Baaja Baraat have composed for the film while veteran lyricist Javed Akhtar has penned the lyrics. The album is made up of 5 tracks, one of which is a remix, and features the vocal talents of Sonu Nigam (‘Shukran Allah – Kurbaan), Benny Dayal (‘Tu Hi To Meri Dost Hai’ – Yuvvraaj), Shreya Ghosal (‘Teri Ore’ – Singh is Kinng), Shafqat Amanat Ali (‘Bin Tere’ – I Hate Luv Storys), Shruti Pathak (‘Mar Jawan’ – Fashion), Shrradha Pandit (‘Genda Phool’ – Delhi 6) and Salim Merchant (‘Ayvi Ayvi’ – Band Baaja Baraat). Love Breakups Zindagi, which also stars Cyrus Sahukar (Aisha) and Tischa Chopra (Taare Zameen Par) releases on 7 October 2011. The soundtrack commences with the optimistic Rozana by Salim Merchant that radiates positive vibes with every note. It is a very hopeful number that sees beauty, opportunity and goodness on a daily basis in things as mundane as mornings and nights. Written, performed and composed with equal parts zest and soul, Rozana is perfect for the daily commute (as depicted in the promo) to work and back. It has the ability to psych you up for the day and wind you down for the night. The track’s enthusiasm for life is impressive if not contagious. Rozana is also available as a remix, courtesy of DJ A-Myth that just speeds up the number a little and adds a few extra beats. Next is Rab Rakha, that is just sheer beauty from the get go. It has already won the hearts of hundreds what with its promos hitting the music channels in the recent weeks past and rightly so. Salim, Sonu and Shreya effectively re-create the magic witnessed in ‘Shukran Allah’ (Kurbaan) with Rab Rakha. The track reflects a myriad of themes, in that it serves a situational number, a light dance track, a romantic duet and a prayer all rolled into one. It is as impressive lyrically as it is musically. We definitely have another Merchant masterpiece on our hands with this one. Next is Love Love Love, a cute little boppy number by Benny and Shruthi that will get your feet tapping in no time. The track has a very sunny disposition in terms of lyrics, music and vocals. It is a street-side-symphony of sorts that is in love with the feeling of falling in love. Benny and Shruthi’s youthful vocals add to the freshness of the track. The album ends on a sombre note with Chhayee Hai Tanhayee, a melancholic qawali sung to perfection by Shafqat Amanat Ali, Shrradha Pandit and Salim Merchant. As morose as they are, Javed Akhtar’s lyrics are first rate. It is a real pity that it is the shortest track in the soundtrack. All in love, Love Breakups Zindagi, practices what it preaches in that it has songs of love, life and all that lies in between. Rab Rakha and Chhayee Hai Tanhayee obviously come out on top while Love Love Love and Rozona are close runner-ups. In any event, there is something to be loved about each track from the soundtrack and the Merchant brothers continue to remind us why they are considered as one the best musical duos of the current era.